The PowerPak Pro is a regulated power supply with an aluminum housing which is suitable for permanent installations and outdoor applications. 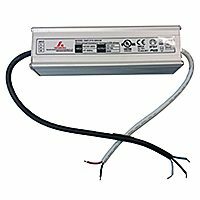 This power supply comes with bare wire leads, it is up to the user to find adequate wire harnessing solutions on both the AC input and DC output portions of the supply. Recommended for users with electrical installation background only.